In case you missed it, the legal and bureaucratic battle over the Dakota Access and Keystone XL pipelines is finished. We won. President Donald J. Trump signed two executive orders to move forward with the projects. The Army Corp of Engineers signed off on the Dakota Access Pipeline’s final permit. And a judge refused to hear an appeal to block the project’s construction. After Trump won the 2016 election, it was only a matter of time before the incoming president would sign off on the projects. Hundreds of protestors flocked to Standing Rock Reservation in North Dakota to protest the pipeline’s construction, which activists say will desecrate their sacred burial grounds and would contaminate their drinking water along the 1,172-mile route. There have been claims that Dakota Access LLC never consulted the local tribes about the pipeline. They were consulted 389 times. There are also archeologists on site just in case construction runs into a burial site. Those involved said it was not an effort to destroy the camp, which sits on U.S. Army Corps of Engineers land, but a move to prevent waste contaminating water sources. There are dozens of abandoned cars and structures as well as waste at the camp. “It is paramount for public safety, and to prevent an environmental disaster, that the camps be cleared prior to a potential spring flood,” said North Dakota Governor Doug Burgum, a Republican who supports the completion of the pipeline, in a statement. 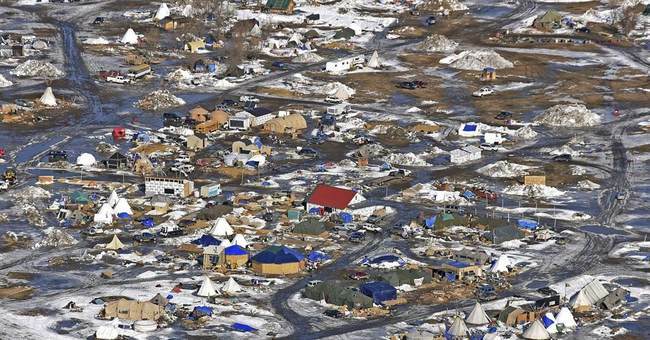 Federal and state officials announced plans Wednesday to accelerate cleanup at a camp in southern North Dakota that has housed hundreds and sometimes thousands of Dakota Access pipeline opponents. Officials fear the camp near the Cannonball River will soon flood due to warm weather and rapid snowmelt. They worry trash and debris left behind by people who have left in recent weeks might pollute the Missouri River and other nearby waterways. "With the amount of people that have been out there and the amount of estimated waste and trash out there, there is a good chance it will end up in the river if it is not cleaned up," Corps spokesman Capt. Ryan Hignight said. Local and federal officials estimate there's enough trash and debris in the camp to fill about 2,500 pickup trucks. Garbage ranges from trash to building debris to human waste, according to Morton County Emergency Manager Tom Doering. So, environmentalists protested the pipeline because they felt it could contaminate the water only to have their protests site accumulate so much crap that it could…contaminate the water. Oh, the irony, folks. If you want to catch up on the day-by-day details, please visit Rob Port’s Say Anything blog. This North Dakota-based blogger wrote about the daily insanity of the pipeline project and the protests. Nicely done, sir.